NASHVILLE, TENN. (March 14, 2017)— Since 2005, the NASBA Center for the Public Trust (CPT) has supported and promoted ethical leadership within the business community. 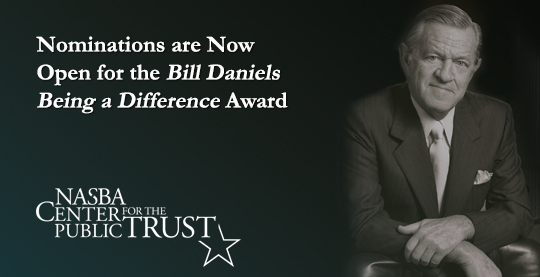 After successfully honoring ethical business leaders for more than a decade through the Being a Difference Award, the CPT is revising the program by creating the Bill Daniels Being a Difference Award program, sponsored by the Daniels Fund. This recognition is reserved for leaders who go beyond making a difference; they establish a reputation for continuously Being a Difference by leading their businesses and communities with honor and integrity. The CPT will annually award up to four deserving individuals with the Bill Daniels Being a Difference Award. The criteria for this special award incorporates the eight ethical business principles Bill Daniels used to guide his actions and decisions. These principles include integrity, trust, accountability, transparency, fairness, respect, rule of law, and viability. The award program is sponsored by the Daniels Fund, and is named in honor of its founder, the late Bill Daniels. A born entrepreneur, Daniels was an early cable television pioneer and was essential to the formation and growth of the industry. He is fondly remembered for his reputation for ethics and integrity, and his sincere compassion for those in need. When Daniels passed away in March of 2000, his estate transferred to the Daniels Fund, making it one of the largest foundations in the Rocky Mountain region. Through the Bill Daniels Being a Difference Award, the CPT recognizes individuals who practice these high standards of ethical leadership. Nominations are accepted year-round, and the CPT encourages the business community to nominate candidates by June 15, 2017, to be considered for the next class of honorees. Visit thecpt.org/awards to learn more.